In this Feb. 21, 2018 file photo, a cyclist rides along a portion of the U.S.-Mexico border fence in McAllen, Texas. U.S. Customs and Border Protection awarded a $145 million contract to construct a six mile-long reinforced concrete levee wall in the agency's McAllen Station region. 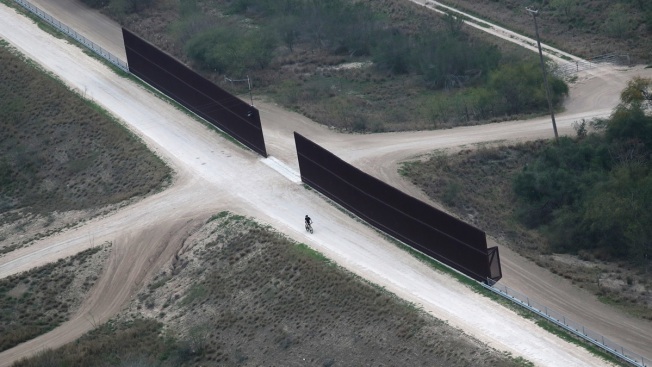 Federal authorities have awarded a $145 million contract to a Texas company to build 6 miles (9.5 kilometers) of wall along the U.S.-Mexico border in the Rio Grande Valley. U.S. Customs and Border Patrol said Friday that SLSCO will begin construction of an 18-foot (5.5-meter) reinforced concrete levee wall in February in the agency's McAllen Station region. The company will also increase the height of existing fences. It will be the first section of President Donald Trump's border barriers in the Rio Grande Valley, the busiest corridor for illegal crossings. The government recently completed construction of a 2-mile (3-kilometer), 30-foot tall (9-meter) section of fencing along the border in California. Trump has been ramping up anti-immigration rhetoric heading into Tuesday's midterm elections and has ordered troops to the border to meet a caravan of Central American migrants slowly traveling through Mexico.